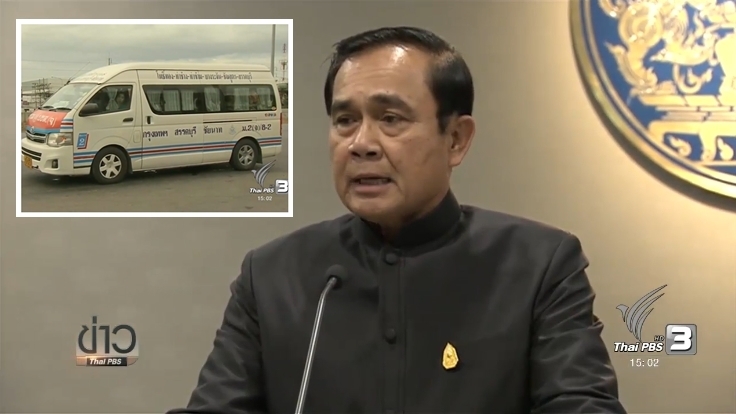 Prime Minister Prayut Chan-ocha has vowed to get tough with public buses and passenger vans to make sure that they strictly abide by the laws within in the next three months from now before the Songkran long holidays when a lot of people are expected to travel to upcountry provinces again. “Simple fact. If there are activities, there are consequences as occurred. Many people using cars, cheap oil, good roads and cars run faster while drunk driving remains. So what laws can solve these problems besides the spirit of joint participation of every one of us. You asked how they can be solved? We in the cabinet have discussed the issue long enough,” said the prime minister, adding that he preferred the next government to tackle the problems. However, he said that he had one last option to deal with rogue public transport drivers within the next three months from now. The prime minister said that every bus and passenger van driver must keep a logbook in which he or she must note down his/her name, the driving time, the route. “Police at every checkpoint must check the logbooks. If a driver is found to have driven beyond the time limit, the vehicle must be impounded and all passengers told to get off to board a new van or bus and a new driver must be found,” said the prime minister. He also threatened to replace rogue drivers with military personnel. The prime minister blamed past governments for doing nothing to deal with illegal passenger vans, but allowing them to be registered and to operate legally while breaking all the safety rules, be it overloading, speeding, illegal modification of the vehicles. However, he admitted that the government alone would not be able to solve the problem with passenger vans unless all parties concerned join hands to solve the problems.